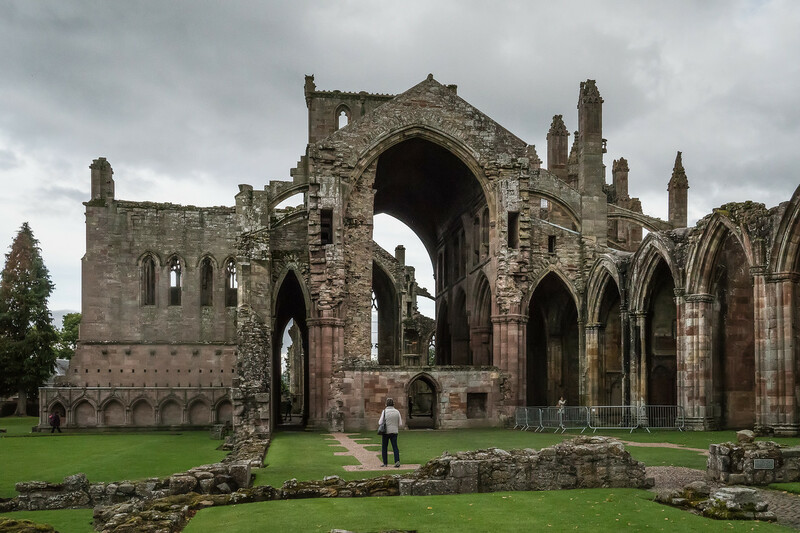 About an hour’s drive south from Edinburgh is the fabulous remnants of Melrose Abbey. I visited there briefly one afternoon. What a treat! 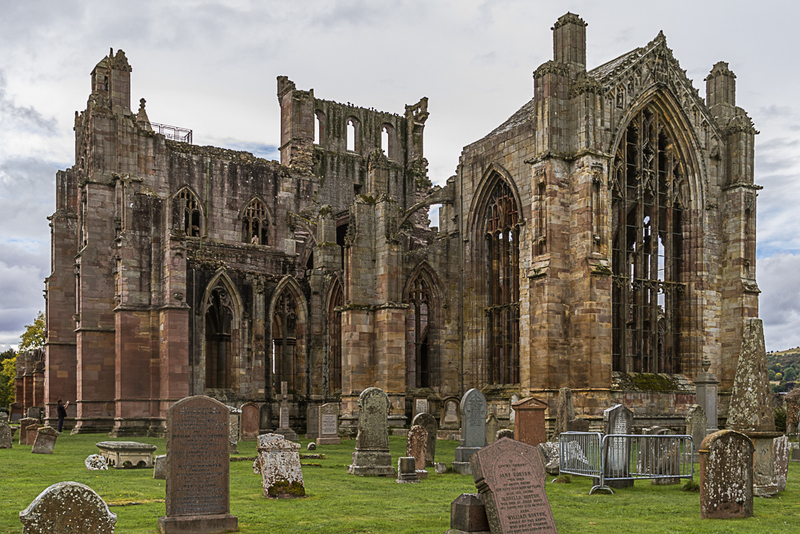 The Scottish king, David I, founded the abbey in 1136 as a Cistercian monastery. These monks, like the Benedictines, followed the Rule of St. Benedict, which called for a quiet, contemplative life. Cistercians took this to mean manual labor and peaceful living. 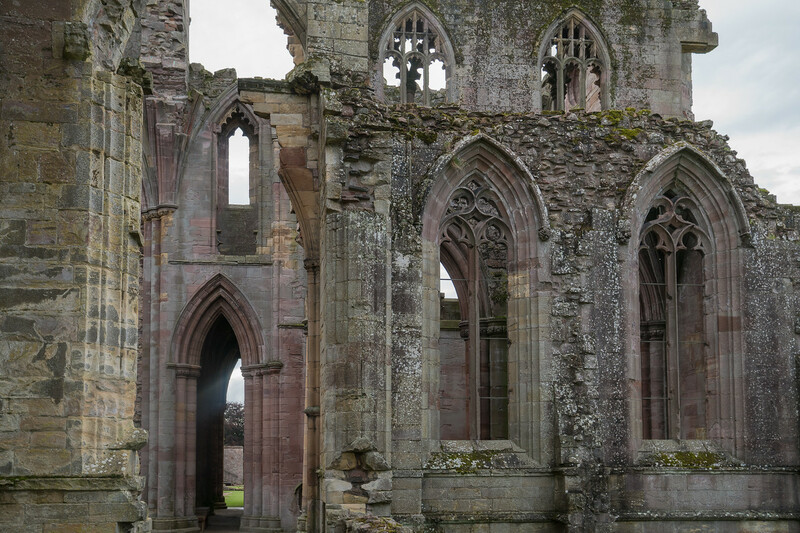 However, they also excelled at architecture, an interest which led them to hire, over many decades, the best stone masons available to complete construction of the abbey. Western entrance to Melrose Abbey. This was a thriving community for a few hundred years but not without some violence and struggle. Is Scotland ever without struggle? The turmoil of war with England also touched abbey life. The building itself was often damaged by the fighting. Repairs or rebuilding ensued. Most of the current ruins date to the late 1300s. By 1541 Henry VIII had closed or disbanded all the monasteries in his kingdom. I won’t go into the history of the Dissolution of the Monasteries. 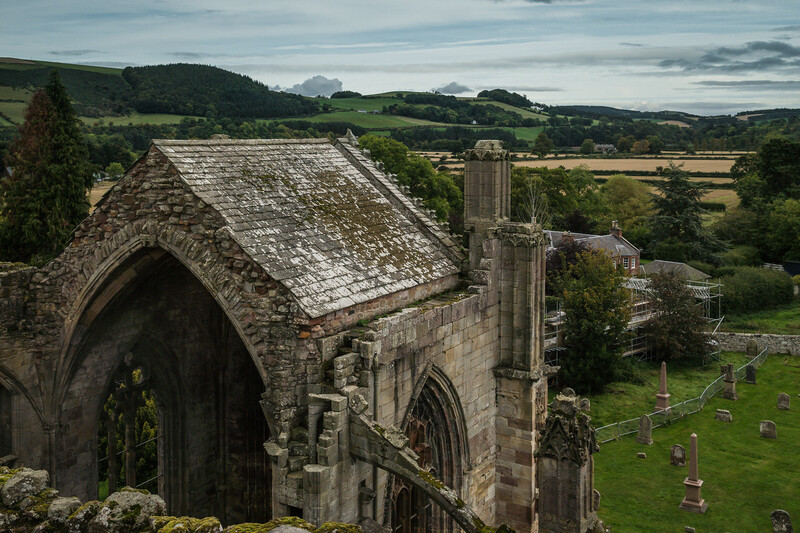 Melrose Abbey didn’t escape this episode. The last monk died in the late 1500s. For me, the trip to Melrose wasn’t about dwelling on the past but about celebrating the present. How fortunate we are to have this abbey. The arches and buttresses are beautiful. The setting, too, is breathtakingly lovely. Living in arid southern California, I miss looking out at rolling hills and fields. I climbed the tower in order to have this marvelous view. As you can see, I took several shots from up there. I deserved it; the climb was challenging. 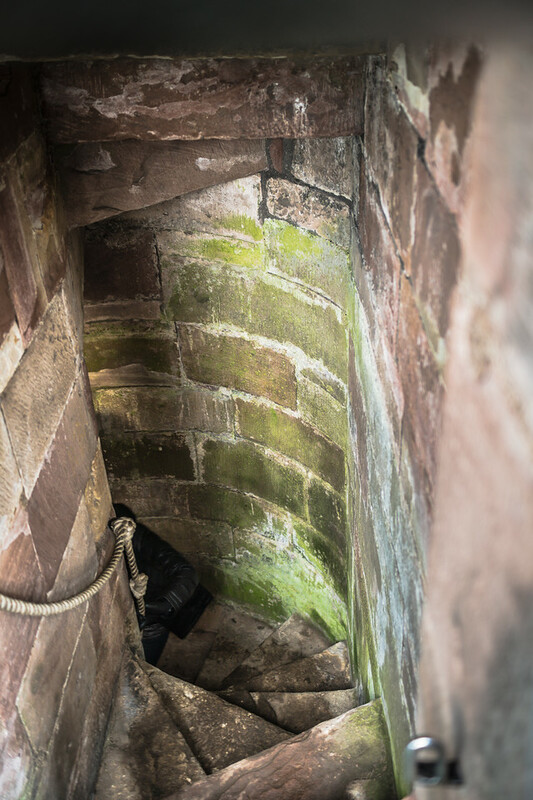 Those spiral stairways are so tiny and the steps are definitely narrow. The abbey’s cemetery is famous as well. Here lie kings and other noblemen of Scotland. I confess I don’t know much about the various kings of Scotland. Alexander II is buried at Melrose Abbey. He dates back to the 13th century. 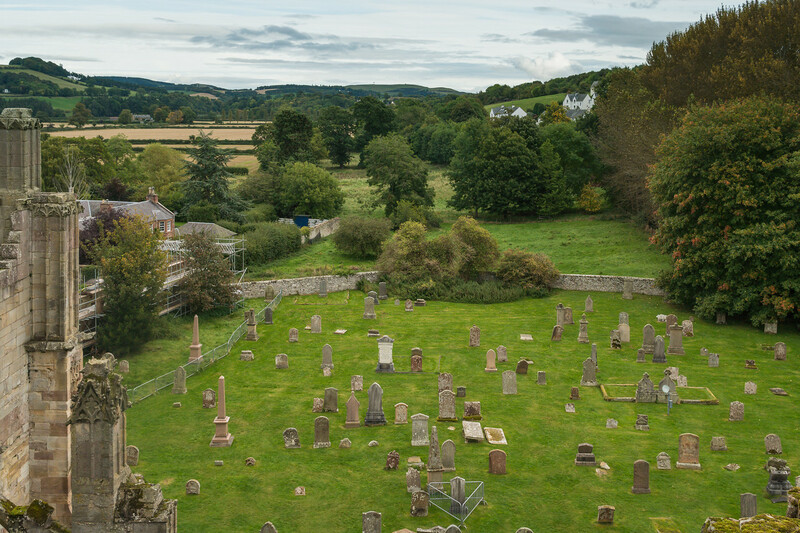 The most famous burial here is that which concerns Robert the Bruce. Somewhere down there is the place where his heart is buried. Is this really his heart? In 1921, archaeologists discovered a lead container bearing a heart. 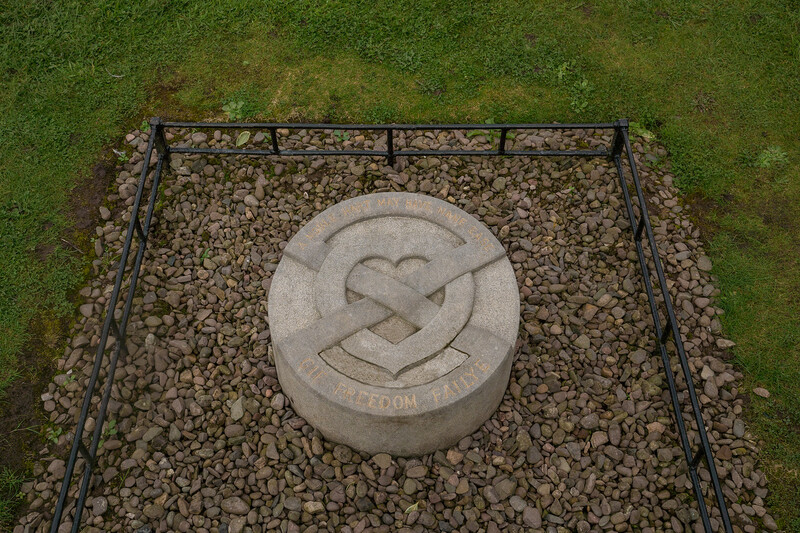 Since no other heart is supposed to have been buried at Melrose, it is believed that this is the heart of Robert I. The container was reburied in 1998. I found the site. If you get to Scotland, I hope you take some time to visit this unusual place. There are great views, terrific architecture, and a museum to explore. To see more of my images of the abbey, please click here.